Hi Mark, Welcome over to The Book Plank and for taking your time to answer these few questions! BP: First off, could you give us a short introduction as to who you are? What are your likes and dislikes? What are your hobbies. ML: I could list the hobbies from my dust jackets but the truth is I don’t find any time for them anymore. I write, I go to my day job (research scientist), I care for my very disabled youngest daughter … and that’s about it. When I find a moment, I read. I like good prose. I dislike exposition in dialogue. Since writing started paying its way I find it hard not to spend my very limited spare time writing and also spending too much time tending my facebook/twitter/blog site. BP: If you would have to sell your series, The Broken Empire, with a single sentence, what would it be? ML: If a person’s attention span doesn’t extend past a sentence my books aren’t for them! I’ve never been a seller, networker etc … just don’t have the knack. BP: The first book you written in the Broken Empire series, Prince of Thorns, was your debut. What gave you the idea behind the whole series? And how did you went about and tackle writing the first book? ML: I don’t plan so I didn’t need an idea for the whole series or even the book. I just had an idea for a character. I wanted to try to write a character like Alex from Anthony Burgess’ book A Clockwork Orange. A charming, intelligent, and very violent young man. So I started typing. I find if I keep typing long enough then I’m at the end of a book. One thing leads to another, as they say. BP: The Broken Empire has a lot of influences ranging from Epic – High fantasy all the way over to Science Fiction (?) and Dark fantasy. It can be tricky to create a bit of a mash-up across genres, but in all three books is works full color. The world that is envisioned by it is just brilliant! How did you plan your story with these different themes? ML: Like I say, I don’t plan. Writing, for me, is just a continuous game of ‘what next?’, ‘and then what?’ ‘but if he did that then this would happen’ and events just roll out. I keep a clear idea of who my character is, but what happens at the end of the page is generally a surprise to me. BP: The whole Broken Empire series has been published now. If you would look back on your books and would be given the chance to revise and particular scene would you do so? And if yes, which one and why? ML: No. I don’t revise my books before they’re published and have even less inclination to do it afterward. Prince of Thorns is 99% the first and only draft that I wrote. My editor has a wonderfully light touch – the changes she suggests are very small but effective. BP: What was your biggest challenge in writing any of the three books? ML: I didn’t really find any of it a challenge. I enjoyed the whole thing. 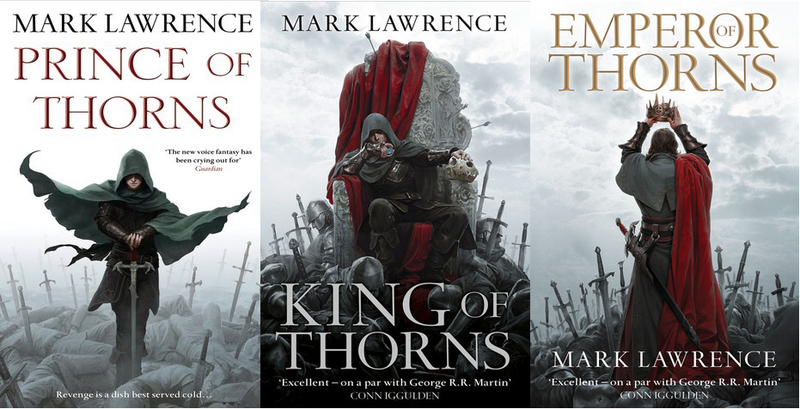 I wrote King and Emperor of Thorns in the same year while working a day job and caring for my daughter. If it had been a challenge I’m not sure it would have got done. BP: Did you encounter any specific problems while you were writing any of the books? ML: Nope … sorry. I’m tempted to make one up to sound more interesting! BP: Jorg is a complicated character, he has a dark past and is shaped by all that he encounters. His earlier self is reckless and eager; while the older version is much more mature. Are you happy by how Jorg has developed over the whole series? ML: Yes. It wasn’t really a conscious effort. He grew in response to the changing circumstances he found himself in. It wasn’t hard to imagine a less impulsive, less carefree Jorg when responsibilities started to crowd him and his gains had to be protected. Life on the road suits a young character, consequence left behind each day as they move on. BP: Jorg doesn’t play by the rules, do you? ML: Jorg isn’t a re-imagined me, no. There’s no wish-fulfillment going on. I got a fine 10 years ago for cycling through a red light. That’s about the extent of my law-breaking. BP: I must say that I was utterly surprised by the ending of Emperor of Thorns, it might come to a bit of a shock to a lot of readers, but it does make the series that much better. Beautiful and haunting at the same time. When and how and why did you decide to let the book end this way? ML: When … is difficult, at some point during the last half of the last book I got a general idea of the position Jorg would end up in. It seemed … self-evidently the only satisfactory conclusion at that point. I can’t give you the why of the decision, but after the fact I can justify it … but that would be a big spoiler. But certainly it wasn’t until I was actually writing it that _how_ he arrived at his destination became clear. BP: The story of Jorg has been concluded in Emperor of Thorns. Your new series, Red Queen’s War which is also set in the Broken Empire universe will have the first book, Prince of Fools, published this June, can you give us a sneak peak of what we can expect? ML: Jalan Kendeth leads us through Prince of Fools. He’s a cowardly, blustering, cheat. A womanizer who tries to ride his title to success. The Broken Empire is a dangerous place though and he soon gets into a lot of trouble. Also there’s Vikings! BP: The world that you have created in the Broken Empire is more than rich can we expect something in the lines of a possible short story collection from different points-of-view? ML: Short stories really aren’t very popular with most of the reading public. I do have a couple of Jorg-based short stories listed on Goodreads and free for anyone who wants to read them. There’s a Brother Sim short story coming out in an anthology too (possibly at the end of the year). BP: Do you have any other projects besides the Broken Empire universe that you would like to explore? ML: I have the desire to explore widely and through all manner of varied stories, but not being a planner I have nothing concrete. One day I may sit down and find myself writing science fiction, literary fiction, or a book for children … all of those would be fine by me. ML: I guess it’s the fact both could lead you absolutely anywhere and nobody can complain that you’ve got it wrong because you control the very fabric of the universe! BP: and just lastly, if you would have to give your top 5 favourite books which would they be? Free Fall – William Golding, Lord of the Rings – JRR Tolkien, A Game of Thrones – GRR Martin, Gormenghast – Mervyn Peake, The Tombs of Atuan – Ursula LeGuin. 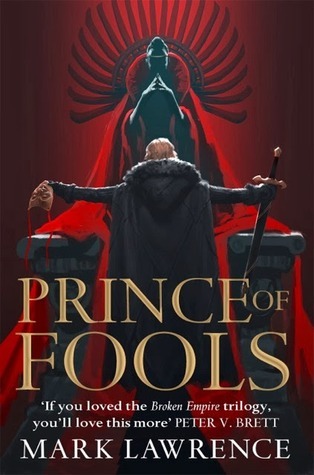 BP: Thank you very much for your time Mark and I already have Prince of Fools pretty high on my TBR list!